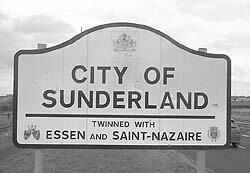 Perhaps if you have paid any attention to the City of Sunderland road signs as you enter Sunderland, you will have noticed that the city is twinned with two other European cities – Essen in Germany and Saint-Nazaire in France. Twinning links were an initiative from the Home Office in the 1940’s, the aim was to break down cultural barriers and reduce the animosity many people felt in the aftermath of the Second World War. The act of Twinning was considered an effective way to move forward in friendship. More recently, twinning has mainly been utilized to introduce young people from Sunderland to the youth of Essen and St. Nazaire in the hope that they will be encouraged to understand the culture of other European countries. Essen was selected because, at the time, it shared a dependence on coal mining and heavy industry. St. Nazaire was chosen on the basis of a similar population, geographical location and shipbuilding history.